Ilha da Queimada Grande, as seen from above. 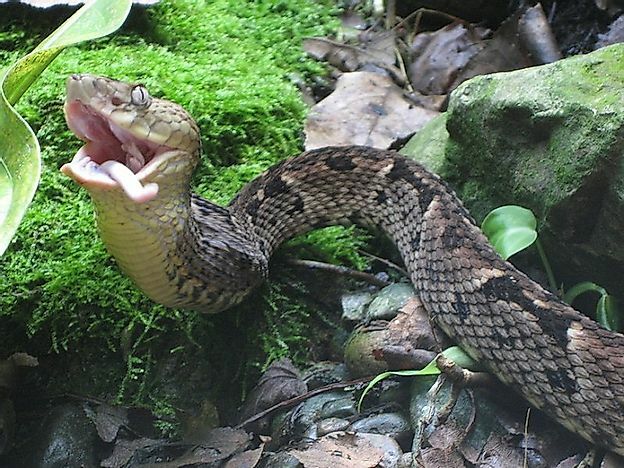 The highly feared Ilha da Queimada Grande, or Snake Island, of Brazil is one of the most dangerous places in the world, and a place where human entry is completely restricted to save people from dying an agonizing death triggered by death bites dealt by the island’s Golden Lancehead pit vipers. 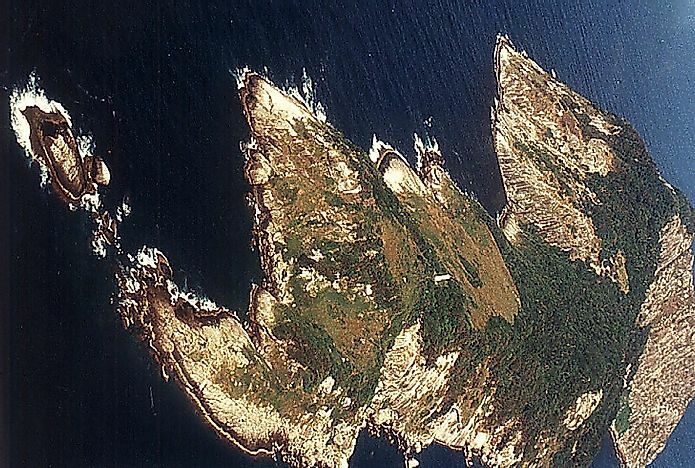 The Snake Island is located 33 kilometers away from the mainland Brazilian city of Sao Paulo on the Atlantic Ocean. The island encompasses an area of around 430,000 square meters, with an elevation of approximately 206 meters above sea level. In the past, during Portuguese occupation of Brazil, the lha da Queimada Grande was subjected to slash and burn agricultural techniques to clear vast tracts of native forests for banana plantations. However, these attempts were not too successful and discarded at a later period. In 1909, a lighthouse was constructed on the island to warn ships about this island which now operates in an auto mode. Recognizing the dangers to human life from the snakes of the island, the Brazilian Navy completely banned the entry of all people to the island except for researchers and navy personnel with authorized consent to enter the island. While locals claim that the snakes were brought on the island by pirates to protect their buried treasures, scientists claim that the island was cut off from the mainland 11,000 years ago by rising sea levels. This led to an independent evolution of snakes on this island, resulting in the endemic Golden Lancehead pit vipers. Endemic to the lha de Queimada Granda in Brazil, the Golden Lancehead pit viper (Bothrops insularis) is one of the most poisonous snakes in the world. The length of the snakes range between 70 and 118 centimeters. Like other snakes belonging to the Bothrops genus, the Golden Lancehead has an elongated head pointed at the nose. The golden-brown color of its body lends it its common name. The snake produces venom which is both hemotoxic and neurotoxic in nature. Its diet is based on birds, lizards, and other snakes. It is also known to practice cannibalism. Since the species inhabit an island which is completely off limits to human entry, very little data regarding human deaths induced by this snake exists. However, it is claimed that, if untreated, the Bothrops venom can kill an adult human being in less than an hour. The lha da Queimada Grande region experiences a temperate climate. Large parts of the area of this island are covered by rainforests while there are also areas with exposed bare rocks and grassy clearings. Around 2,000 to 4,000 Golden Lancehead pit vipers inhabit the island. Besides these vipers, other species of snakes, frogs and lizards also occur here. A large number of birds, many of them migratory in nature, also visit the lha da Queimada Grande, some of them ending up as the prey of the Golden Lanceheads. A large biodiversity of insect species also thrives on this island. The Golden Lanceheads of Iha da Queimada Grande are currently suffering from several threats to their population. Though highly protected on the island where human entry is completely restricted without permission, the snakes are illegally captured or poached by "biopirates" who smuggle these snakes to scientists or collectors who are ready to purchase them for prices as high as $10,000 to $30,000 USD. The clearance of vegetation on the island by the Brazilian Navy also impacts the survival of these snakes. Over the last 15 years, the population of the Golden Lanceheads has decimated by nearly 50%. Which Snake Has The Longest Fangs And The Highest Venom Yield In The World?